Using Add New Item dialog box, add a User Control and name it Component1 . 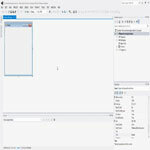 select Component1.cs and choose View Code to view the code. Now delete everything and replace it with the following code. Rename the namespace to the one you are using. Visual Studio will give your namespace same name as your project name. Go to Component1.Designer.cs and remove the following line in InitializeComponent method. Method is located in Component Designer generated code region, so expand that region if necessary. If you found this article useful, drop a comment or connect with the blog on the social networks. Nice. Just what I needed to create a component in my VS2013 Express.